L-R: Vista, Autocrat, Blue Bird. Shahson's Pencil Company of Pakistan has been making pencils since 1953. The current director of the company is the grandson of the founder, Shah Saeed. Along with writing pencils, which I'll be reviewing today, they make pens and other stationery items for the home, school, and office. The Autocrat: Shiny brown lacquer with a gold foil stamp. It has a black end-dip with a fat gold stripe where a ferrule might be. This is the only one of the three with the UPC stamped on the opposite side. The Blue Bird: a nice true blue lacquer with a black end-dip and a fat orange stripe in the ferrule spot. The Vista: straight red all over with a thin white stripe separating the end from the shaft. 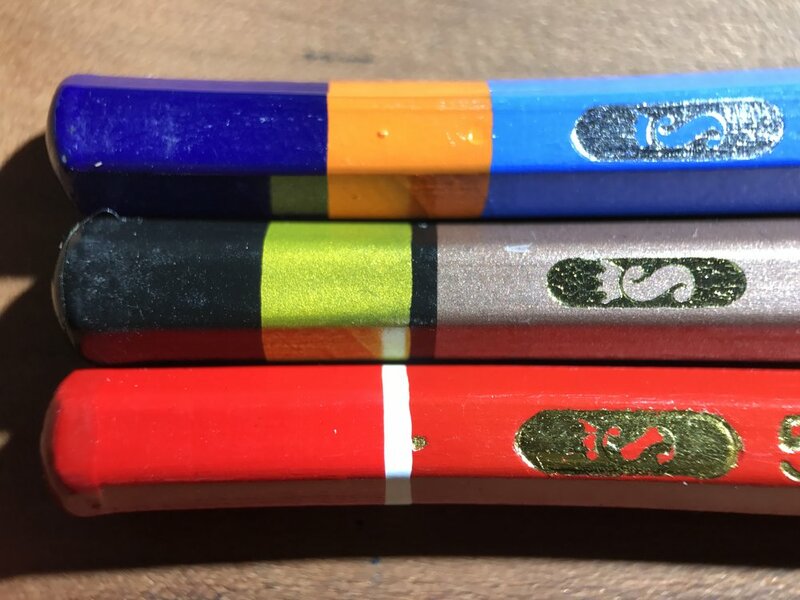 All three of these pencils use the same gold foil stamping, which is printed left handed. The quality is decent. They all say Shahson's, but the Vista adds "Pakistan" on the imprint. The Vista stamping is of lesser quality than the other two. The gold is highly reflective...I had trouble getting a good angle to snap a usable picture. Their lacquer is thick, but chipped in a few spots. The Blue Bird flaked off at the end by just rubbing my thumb across it. I'm thinking these are basswood. 2 out of 3 Autocrats I purchased were off-centered, and the one I sharpened was so bad that it left wood all the way down to the point when sharpened in my Carl CP-80. I threw it in the Pollux and it removed a bit of it to make it usable, but nothing, and I mean nothing, turns me off more than an off-centered core. That being said, the Blue Bird was fine and the Vista was centered perfection. These aren't curved...it's the macro lens. See the wood creep on the center one? That was after I cleaned it up with the Pollux. I can't say one way or the other if these cores are different or all the same. They're graded all the same, and in my writing tests, all three performed the same: scratchy, with good point durability, and all true to HB. If they are different, it's not enough to matter, and I think they're basically the same pencil in different clothes. They erase very well with the Seed Radar eraser I used in testing. These pencils have no eraser, so they're balanced throughout. They are very light and thin, but they don't feel fragile. They are not as robust as a pencil from Hindustan Pencils, but comparable. They are somewhere between full-hex and semi-hex, with the Autocrat being the softest hex, and the Blue Bird inching towards Musgrave territory. These are a decent semi-cheap writer. 40¢ for the Vista and Blue Bird, 60¢ for the Autocrat. My pick would be the Vista, as I had the best luck with the cores being centered on this one and the red is REALLY red. The writing is not any different for the extra money on the Autocrat, but it is a rare pencil that is brown lacquer, so if it's worth the extra 20¢ to you, get it. The Blue Bird was my "meh" of the bunch, but remember, since these cores are so similar, if not exactly the same, you're really choosing on aesthetics. Available at CW Pencils and The Thackery. For another take, check out The Weekly Pencil.